I wonder if Devi and her enormous Shakti is deified and respected only because she is a speechless idol, dressed in her brightly-coloured saree, sitting calmly inside a decorated templ? Is her glory but an idea? What about her flesh & blood avatar a.k.a. women who are struggling to be seen, heard and recognised for who we are – equally human, equally important? On 8th March 2017, it would be exactly a hundred years since the 1917 strike by Russian women that helped force the abdication of the czar and the right of women to vote. Before that in 1908, on the same day in March, 146 women died protesting their labour condition in a New York garment factory. Those were some of the first instants of women coming together to battle society’s discrimination against them. I wish they were stories from a by-gone era, but we all know, they are not. Gender equality and development – which was the original aim of International Women’s Day – is still far from being realised. In our homes, even today, it is the women who have to ‘let go’ to keep ‘peace’. Our voice, more often than not, is secondary. Those amongst us making big waves in corporate, business and political worlds’ are having to work twice as hard as the man standing on our left, while pay-gap & discrimination persists. This year let’s make a promise to take groundbreaking steps, in doing more than we imagine ourselves capable of, to not only help ourselves but help other women who need us. Let us aspire and inspire, be bold and make the change, be the women we dreamt of being before fear and the bias of our society stepped in. Let us start today. We have to. Because there is simply no time to waste. 10 Quotes for sharing, inspiring and taking the first step towards a greater change…. While great strides have been made since 1900s, it is important to mark International Women’s Day because it is both a symbol and an opportunity to reflect on the choices we are making, as individuals and as a society, and how each one of us contribute to a just world and a culture of equality. 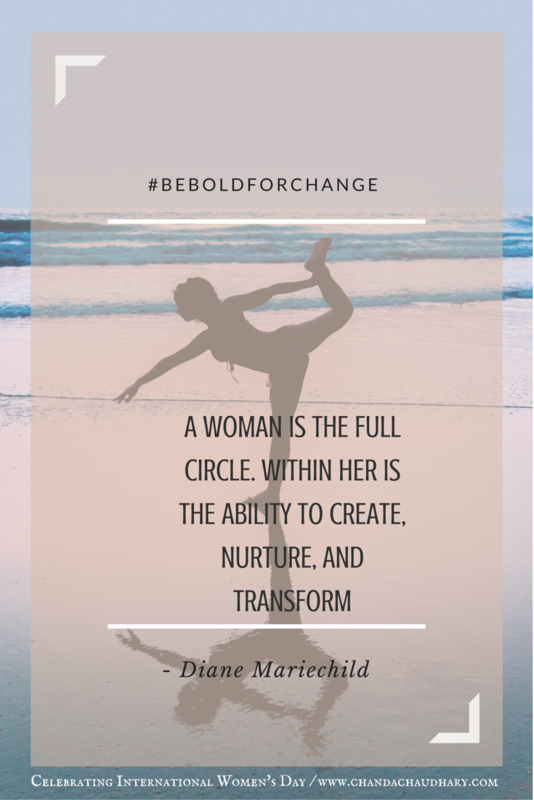 Here’s to being bold, being courageous and being the change we want to see. Previous Previous post: The world’s 15 oldest tea rooms: which one’s your cup of tea?